MTI Kayak Lab Rats traverse the Snake River with a kayak roll mid-stream as part of the sport-specific work capacity programming in the Kayak/Paddling Pre-Season Training Plan. Helen combines multiple training attributes – gym-based strength, gym-based work capacity, assessment-based, and gym-based endurance, climbing fitness and chassis integrity all in the same plan. This much variety, combined with a 6 day/week schedule and overall intense training sessions results in a super challenging, but super-interesting and engaging base fitness training plans for multi-sport and all around mountain athletes. Helen’s deploys our TLU Strength Progression, which often means directly after the warm up, the athlete must complete a 1 Repetition Maximum (1RM) effort on a single strength exercise. TLU was the first, original strength progression I ever designed and it pulled from multiple theories – with the daily 1RM effort coming from famous powerlifting gym, Westside Barbell in Ohio. Long ago I read the gym founder, Louie Simmons’ book, and I’ll be honest, had trouble following much of it. However, I do remember his position of daily performing 1RM efforts, as a way to keep his competing powerlifters engaged, and working as hard as they could. One thing you’ll see if you go into any commercial gym where athletes coach themselves is few ever do 1RM efforts. We’ve found that not only do 1RM efforts help us get a snapshot of an athletes strength, but also help new and experienced athletes get comfortable with the exercises and heavy load. (1) 60 Minute Grind …. Finally, for climbing fitness, Helen deploys the Bouldering V-Sum – which I consider the most efficient training tool available to train both climbing strength and technical ability in a consistent, focused, measurable manner. Of all the different types of mountain athletes I’ve worked with, kayakers have been by far the hardest working, most open-minded and overall, most fun to work with. Jackson is not a kayaking mecca – so it’s not every Spring I get to work with kayakers, but when I do – it’s so much fun. First of all, kayaking paddling from a strength perspective includes simultaneous and opposite single arm push and pull strength and strength endurance, while at the same time requiring midsection anti-rotation strength and strength endurance to brace against the upper body forces. Unlike any other mountain sport, even rock and ice climbing, the lower body (legs) are largely taken out of the fitness demands for kayakers – and the focus of the strength and strength endurance work is on the upper body and mid-section. Developing the gym-based exercises to sport-specifically train these types of strength was an exercise in experimentation on my part, and significant suffering on the part of my kayaker lab rats. We tried Reverse Bench Presses, Horizontal Pull-Ups, Rope Climbs, Scotty Bobs, regular Bench Presses, Elevated Front Bridges for time wearing a weight vest and created a bizarre exercise called the Kayak Special which combines a GHD, alternating dumbbell bench presses, and mid-section isometric strength! We didn’t even try to create some type of sport-specific gym-based work capacity effort. Instead, I made my kayakers load up their kayaks and meet me at the ice-filled, spring-runoff flowing, Snake River two days a week for hard paddling intervals against the current! 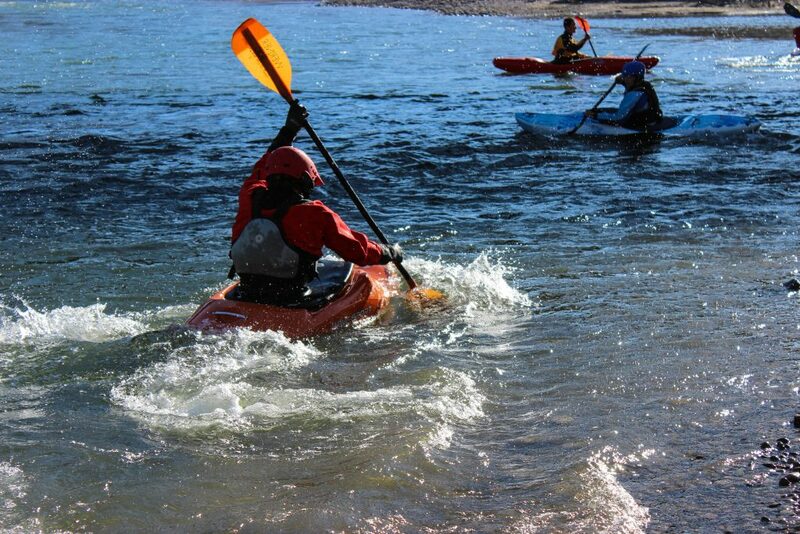 I’d also make them traverse across the river, and have them complete a kayak roll mid-stream going and coming! The best is when I’d have them kayak across the river and back, exit their kayak, pick it up, run up a hill and back with it, and repeat … for like 40 minutes! (See video below). Through it all, they kayakers worked hard, never questioned, and always brought effort and competitive spirit. Like all MTI programming, every year we improved and eventually settled on Alternating Dumbbell Bench Presses, Renegade Rows, and Seated Russian Twists to train gym-based sport-specific strength. At the river I continued to improve our interval work, and settled down from some of the crazy longer efforts. One of secondary benefits of the Kayak/Paddling Training Plan is that with all the high rep upper body and core work, my Kayakers all got jacked!! At the end of the 6-week cycle, they had bulging pecs, lats, biceps, and 6-packs! Overall a lot of fun and super effective programming … after I figured it out …. (4) Total Body and midsection strength for durability. At the top of this plan’s 8-Week progression, the athletes complete 2+ hours hanging on their tools, 50x Figure 4’s with minimal rest, 1,000 loaded Step Ups and 5 miles of running in the same session, and 5 total minutes of Calf Raise Intervals with minimal rest. This work is in addition to barbell-based total body strength work and gym-based mid-section work. It’s a very sport/event-specific, focused, training plan which has proven itself on some dangerous, alpine expeditions.